Inclusive wins The Queen’s Award for HelpKidzLearn! An A-to-Z of your comments & compliments. Thank You! The Queen's Award for Enterprise: 2016 has been won by Inclusive Technology for our HelpKidzLearn special education online resources. The Award is for International Trade reflecting the fact that over seventy percent of HelpKidzLearn subscribers are based overseas. You can read, watch or hear the full story of what this great team have achieved there are interviews on breakfast TV and local radio linked at the end of this article. Early press coverage is also linked plus a company video with a quick 60 second version if you are stuck for time. I'm delighted that of the 35 kindly commentators below, a dozen are business rivals; many are major authorities in assistive technology; ten, like me, have a background in teaching - indeed three are university professors in various aspects of technology, education and special educational needs. Congratulations on the Queen’s Award win! Rick Bullock: former CEO QED Ltd.
Well done Martin and all the team. Barbara Cannon, Assistive Technology Specialist, Spotsylvania, Virginia, USA. I am writing today to celebrate the excellent services and supports I get through Inclusive Technology, HelpKidzLearn and ChooseIt! Maker 3. Together these incredible services comprise a company with integrity, heart, and vision. I salute you on being the winner of the Queen's Award for Enterprise in 2016. I can hardly remember a time when Inclusive was not part of my toolkit. Initially, their catalogue offered the best in assistive technologies and software products to support the needs of a broad range of students with disabilities. Their understanding of the needs of this fragile and under-served population was, and continues to be, right on target. Later they morphed into providing awesome online services that are important (no.... critical!) to the education of students with significant challenges. They fill up the world's void where a wide range of accessible educational activities SHOULD be, and they do it with incredibly engaging and well- conceptualized activities. Well done! Many congratulations. You must be over the moon. A well-deserved award. Jacquie Clarke: President, News2You, Inc.
We thoroughly enjoy working with everyone at Inclusive because we share the same vision - enriching the lives of individuals with special needs. Inclusive has consistently proven through the years to be one of the product leaders in special education in Europe and the United States. Congrats to all. You are a most deserving group of wonderful people!!! Congratulations Martin Littler FRSA and all at Inclusive Technology Ltd on your Queen's Award for Enterprise. Well deserved. 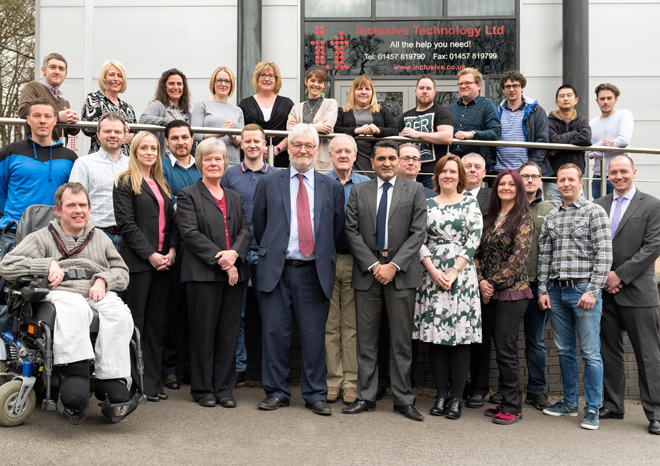 I’m delighted to see this award going to an Assistive Technology company, and particularly to Inclusive Technology. UK companies lead the world in this sector, providing tools that transform the educational opportunities for children with special needs and disabilities. Companies like Inclusive are continually innovating to harness the power of technology for this vital purpose, and it’s great to see this recognised by this award. Noel Duffy: Managing Director, Dolphin Computer Access Ltd. Please accept my heartiest congratulations – big, big feather in your cap. Hi, Martin, Just a note to congratulate you and the team at Inclusive Technology on winning the Queen's Award for Enterprise. You have certainly led the field in this area since setting up in 1996 and your impact on youngsters, as we knew from our experience at Foxdenton, has been immense. Well done! Hi Martin, Great news! Get that flag flying! Many congrats Martin. I always admired the way you worked so damned hard and yet maintained just the right mix of humour and cynicism. No one I know had your energy; and no one I know deserves accolades more than you. Congratulations Martin and all the team at Inclusive on a great achievement. Many congratulations from The Bethlehem Project. A well-deserved award. Cynthia Hyde, Katy Independent School District, Texas, USA. What a wonderful acknowledgement of your work and products, I am so happy for the Inclusive team! There are those who think "disruption" a good thing. But for 'special needs' educators supporting children and their families it can be a double-edged blade. The value of Inclusive Technology is that it understands the experiences of its customers and the technology they already use and value, while keeping them up with cutting edge devices like tablets and 'eye gaze' so they can truly have the best, and most appropriate, of both worlds. Terry and Roxie Johnson: founders of the Mayer-Johnson Co.
Inclusive Technology has been a leader in British assistive technology for many years. Their organization of conferences and trainings has been instrumental in keeping teachers and professionals up to speed in the full range of problem solving for people with special needs. We have found the employees to be capable and experienced, which makes the company a central resource of information. The products in their catalogue include materials from many companies and a broad spectrum of solutions. Congratulations to Inclusive Technology on winning of the Queens Award! Arjan Khalsa: CEO Conceptua Math, former CEO IntelliTools Inc.
Congratulations on your Queen’s Award! It is wonderful news and well-deserved. You and your workforce must be over the moon. Inclusive was ahead of the game 20 years ago: Today it’s the world leader. Access + Engagement = SUCCESS! Inclusive Technology and HelpKidzLearn have consistently provided high-quality creative supports for students who struggle with access. Their mission to offer free and low-cost materials, including online formats means that ALL students can enjoy their products. A well-deserved award for a fantastic team! On behalf of all the children in Australia who benefit from assistive technologies, Spectronics congratulates Martin Littler and his dedicated team at Inclusive Technology and HelpKidzLearn, on receiving our Queen’s Award for Enterprise 2016, on the very special occasion of her 90th Birthday. Enjoy the moment m8 – well deserved. Excellent! Martin looks more and more like an Old Testament Prophet. Congratulations on receiving the Queen’s Award for Enterprise: 2016. From which I note that you are still soldiering onwards and upwards. Well done and all the best for the future. I am delighted to hear the news that Inclusive Technology has been awarded the prestigious Queen’s Award for Enterprise: 2016. Having seen the impact of their considerable contribution to the field of Assistive Technology supporting learning for children and young people with special educational needs and disabilities in this country and overseas, this Award is a fitting tribute to their legacy. I know this Award will continue to motivate Inclusive Technology to produce high quality resources for special education schools and settings and many more children and young people will continue to develop and achieve in their education as a consequence. Professor Jane Seale: Open University. I am delighted to learn that Inclusive Technology has been awarded the 2016 Queen’s Award. Inclusive is the most well-known special needs technology company in the UK- on top of this it is one of the most respected. Inclusive Technology has managed to achieve this in a number of important ways. Firstly, they have populated their company with talented staff, many of whom have a background in teaching or in software design. Whatever their background, all of them have a passion and a commitment to doing the best they can for learners with special educational needs and disabilities. This commitment is recognised by the special needs community and associated markets as sincere and gives Inclusive Technology a credibility which is well earnt and priceless. Secondly, Inclusive Technology uses its position in the community to advocate for the rights of children with special needs and disabilities to have access to the technologies they need to live the lives they want to live and to support the teachers and therapists who work with them. Through this advocacy and support Inclusive Technology has developed and maintained a wide number of partnerships with key stakeholders in the field that transcends commercial interests and places the learner or the child with special needs at the heart of its mission. Finally, Inclusive Technology has managed to successfully negotiate the very difficult path of remaining commercially viable in what is considered a niche market. They have done this by making brave decisions and developing sustainable relationships with their customers and stakeholders. In my current research I have interviewed a number of these stakeholders and have been struck by how, despite the fact, that some of the stakeholders have not always agreed with the decisions that Inclusive Technology have made, they have retained an admiration and respect for what they have achieved and most importantly what they have contributed to the very important field of special needs technology. Our Assistive Technology department has been using both HelpKidzLearn and ChooseIt Maker 3 software for three years. We work in a nearly entirely inclusive school district, where students with disabilities are educated within the general education classroom alongside their same aged peers. We serve students with a wide range of disabilities, including students with intellectual, physical, and learning disabilities, autism, visual impairments, and students with other health impairments that can make learning challenging. Our assistive technology department was looking for software that would meet a wide range of needs while also giving our students access to the general education curriculum. We needed something that was engaging for our students, could be programmed quickly and customized to meet our curriculum standards, and did not come with heavy training demands for our teachers. ChooseIt Maker has met this need for us. Nearly all of schools in our district now have ChooseIt Maker licenses because it meets all of the needs described above. It is being used by a variety of students because of the options it offers. We can customize the software to match and parallel what our students are currently learning in their individual classrooms. Depending upon the students’ ability, we can increase or decrease the number choices they have in answering questions. If we have a student with higher visual needs, we can easily put images with both the question and the answer choices. If we have a student that struggles in reading, we use the recording options to record the questions and the choices. ChooseIt Maker meets our access needs as well, as we have students with physical disabilities using the two switch and automatic scanning options and students who require touch access using the software through ChooseIt Maker’s iPad app. We love that the software is web based and teachers can create and share activities from any computer, not just on a computer with locally installed software. More than anything, ChooseIt Maker is increasing the independence of our students, allowing them to complete activities without adult assistance while still accessing the same curricular standards as their peers. The Inclusive Technologies staff is accommodating, respectful, and easy to work with! We plan to continue our relationship with them for years to come as we’ve seen results from using ChooseIt Maker and they have proven themselves to be a dependable vendor that meets our needs. This is tremendous achievement and you must be proud of your work and the impact on the disabled children. Congratulations my friend and keep up the good work. Hi Martin - very many congratulations to you, Trish and Roger for a reward so well deserved winning the Queen's Award for Industry. You look very happy and proud in all the pictures and it's a great picture of you all with your staff. It's a long time since those heady days of Simnett's, Cumana, SEMERC and the start of Inclusive Technology. It's been great to see the business develop, and I'm delighted to think I played a bit part at the beginning when you became independent. You have achieved what I never did and have done it so well: consistency, there for the long term, backed with huge knowledge and a desire to better peoples' lives and a wonderful team, led brilliantly by you. Brilliant Martin. Couldn't have happened to a nicer bloke. Just want to add my congratulations to everyone at Inclusive. What a brilliant award to win and so well deserved. Keep going, onwards and upwards. I used to be your mailing list number 1 when you were naive enough to start your mailing list at number 1)! Hi Martin, I’ve just watched your Facebook entry re the Queen’s Award - congratulations, I’m really pleased for you. Hi Martin. Well done to all the team and well deserved. You made MY working life so much easier and rewarding because whenever we collaborated it was just that a collaboration. Some other companies and organisations were wrapped up in vested interests and never really saw the bigger picture. That was not the case with you guys. I felt you always kept children with a WIDE range of needs and disabilities at the heart of your work and you were always ready to compromise for the greater good even if it was not altogether in your commercial interests. Inclusive Technology’s mission to provide resources that help learners with special needs and disabilities to communicate, learn and live a full and independent life has always been the driving force behind your business. I am delighted that the authentic dedication to developing new and innovative resources for these learners has been recognised by this most prestigious award. Congratulations to you and to Inclusive Technology and HelpKidzLearn upon receiving the Queen's Award for Enterprise: 2016, Britain’s top business award. As a colleague in the field of Assistive Technology, it has been a great honour for me to work along with you and Inclusive for over 15 years. We have been very fortunate in the United States to have been able to purchase and use Inclusive’s many software and hardware products for both children and adults with Special Needs. Your company has been a leader among those that have produced high quality educational products that help individuals with physical disabilities, sensory impairment and learning difficulties. Inclusive has been at the forefront of single switch software, programs to help those with physical disabilities learn to use their switches and scanning; mastering cause and effect and emerging literacy; creating unique learning software series like the Big Bang Series, the SwitchIt! Series Extra, the Switch Skills Series, the Maker Series and the HelpKidzLearn website. We thank you, too, for your latest achievement of bringing Eye Gaze Software to us all and for developing a learning curriculum that helps develop early Eye Gaze access. The recent creation of Special World (www.specialworld.net), a free, international website for special educators, therapists, other professionals and parents brings a world of information about special needs, special products and latest research and information about those with special educational needs, including those with severe, profound and multiple learning disabilities. Your company has made a major contribution to the field of Assistive Technology and I would personally like to thank you and your company for sharing it with the world and allowing us all to benefit from your hard work and creative thinking. Congratulations on this brilliant award….very well deserved and quite an honour bestowed by the Queen! Chrissy Wostmann, President n2y, Inc. Congratulations!!! What a wonderful award for a terrific company. I feel so privileged to work with such amazing people doing good work for a special population. Thank you for all you do!